De opere quarte diei. Foliu IIII De opere quarte diei. [The creation of the world - Fourth and fifth day] - SCHEDEL, H.
Title : De opere quarte diei. Foliu IIII De opere quarte diei. [The creation of the world - Fourth and fifth day]. Size : 14.6 x 8.8 inches. / 37.0 x 22.4 cm. Description :On recto : the Fourth day in the creation of the world : God creates lights in the firmament to separate light from darkness and to mark days, seasons and years. The wood engraving has 13 rings with the Sun, Moon and the stars. With the hand of God in the upper left corner. 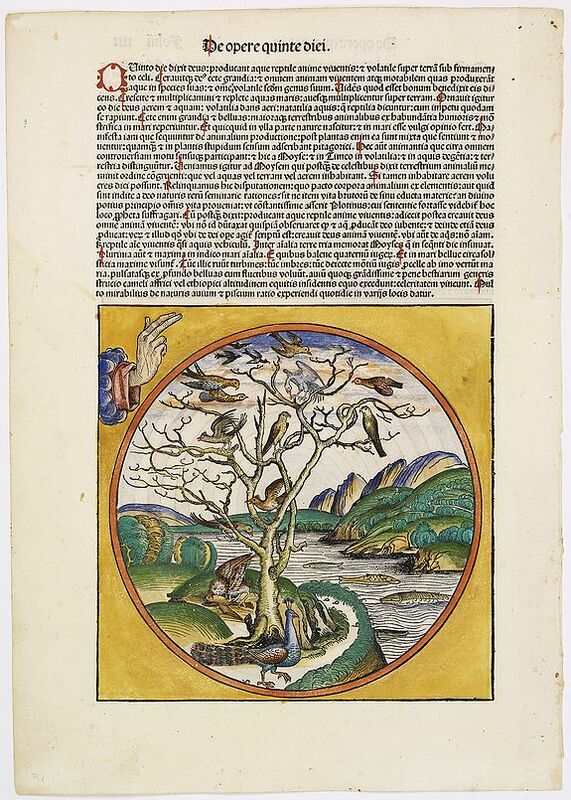 On verso a depiction of the fifth day, depicted by a wood engraving with the sea with fishes, a tree and birds.